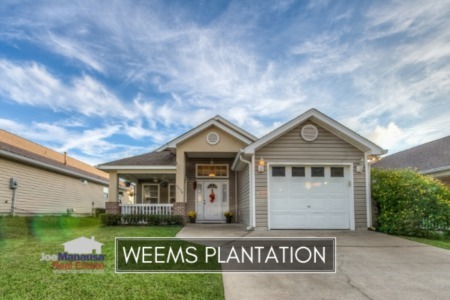 Located on the NE side of Tallahassee just south of the Mahan and Buck Lake Road intersection, Weems Plantation offers 3 and 4 bedroom homes in a highly desirable location. Weems Plantation has homes built from 1999 through 2004, though a few new homes have been built since. Like many of the "boom neighborhoods" that we have discussed in recent housing reports, where all the homes were built and sold in a handful of years, there is the possibility for Weems to be suffering from too much pent-up supply. 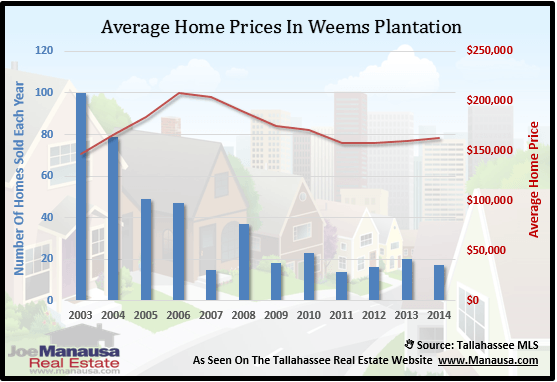 In this report, we will look at prices, values, and sizes of homes in Weems Plantation, as well as show current listings in the Tallahassee MLS and all closed home sales going back to 2003. For every one of the three real estate graphs found in this report, you will find the number of closed home sales for each year (blue columns, measured on the left vertical axis), and an important real estate statistic shown in red (measured on the right vertical axis. It is important to note that sales are through December for all previous years, but through mid December in 2014. Average home prices have risen 2% in 2014 versus 2013, but still sit well below the peak of the market prices established in 2006. Distressed sales are are occurring at a rate a bit lower than what other neighborhoods in Tallahassee are seeing, which I believe accounts for the stability in both home values and home prices. The average recorded sales price is $163,000 for Weems Plantation thus far in 2014. Home sales activity this year is consistent with what we have seen since 2009, but home sales are far lower than the levels recorded during the most active years from 2002 through 2006. Thus far in 2014, there have been 17 closed home sales in Weems Plantation (compared to 100 in 2003!). 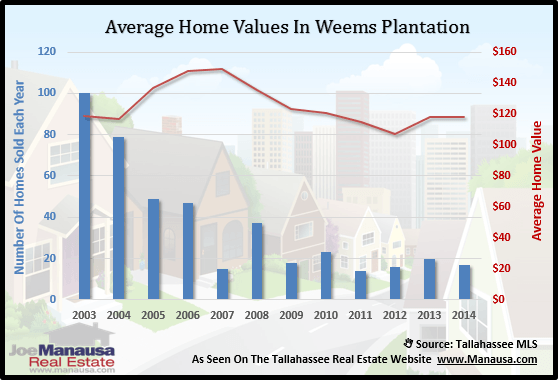 Average home values in Weems Plantation in 2014 are the same as last year, but still 11% higher than the low set back in 2012. Through mid December, the average value of a home sold in Weems Plantation has been $118 per square foot. This is up 10% over the bottom reached in 2012, but still down about 21% from the market high set back in 2006. This means that many homeowners who have purchased or refinanced in the past 10 years are likely at zero or negative equity situations. 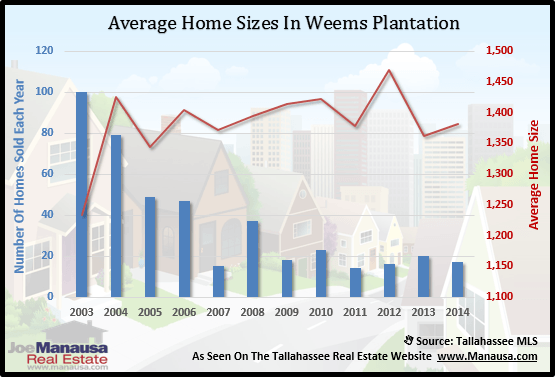 The average home size sold in Weems Plantation typically falls in a range of 1,200 to 1,500 square feet, and this year buyers have been selecting homes in the middle of this range. The 17 sales thus far in 2014 have averaged 1,381 square feet. 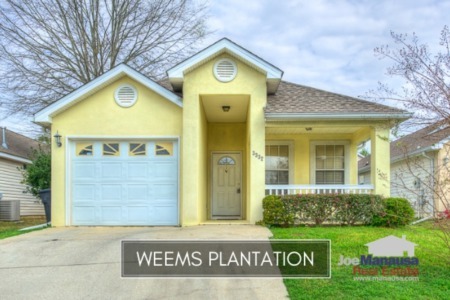 The following list of homes are the most recent listings in Weems Plantation. The following list shows home sales going back to 2003 in Weems Plantation. I hope you enjoyed our December 2014 update on home sales in Weems Plantation, please feel free to drop me a note if you have questions not covered in this report.